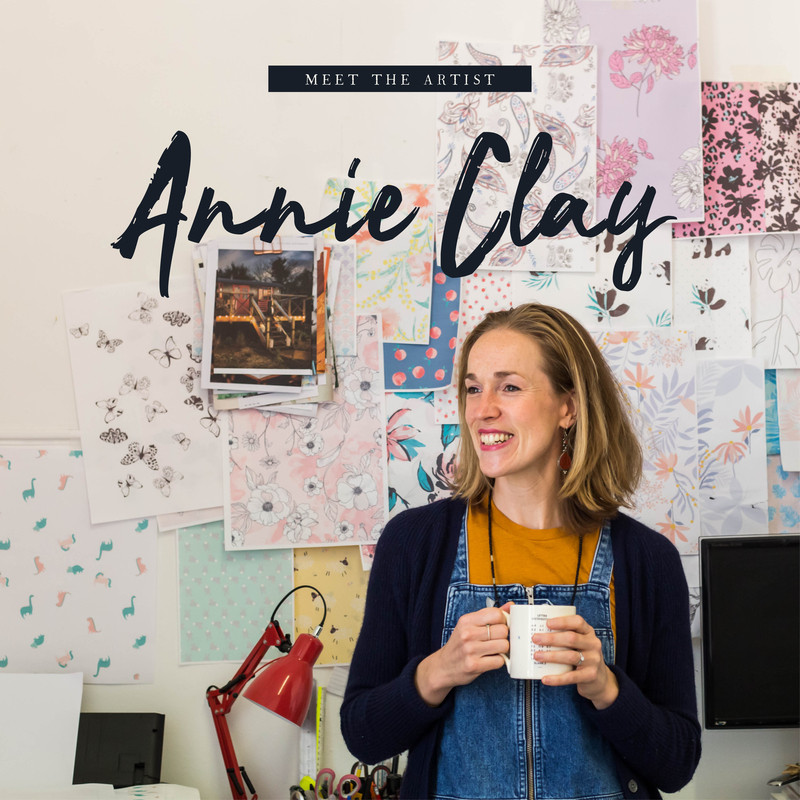 Putting the spotlight on one of the Bristolian artists we are working with on our new opening, we visit Annie Clay at her studio space at creative hub, Jamaica Street Studios for a chat about art and life in Bristol over a cup of humble herbal tea. 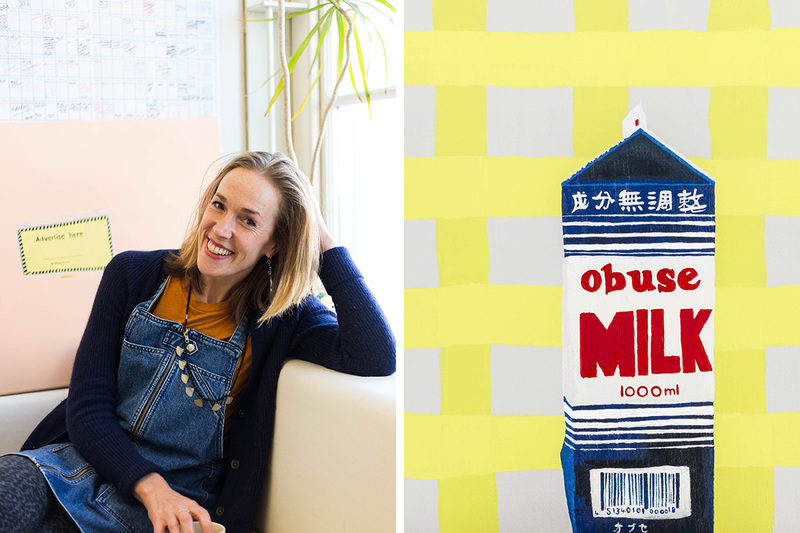 Annie has been a successful printed pattern designer for the last twelve years, having earnt a first-class BA degree in textile design from Brighton University in 2005. Managing to master a harmonious balance between the bold and delicate in her design work, Annie has an established client base including household names such as M&S and Accessorize. 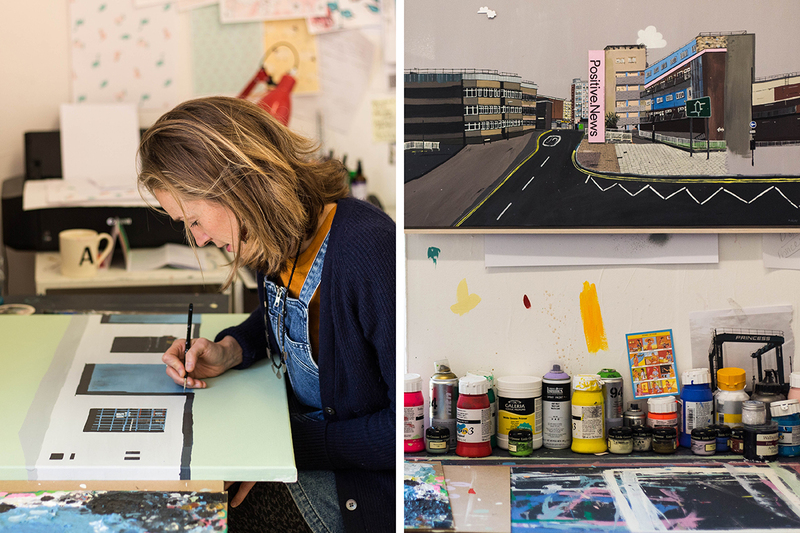 Over some time, she has taken the leap away from design and has been channelling her lust for creating into paintings inspired by her local environment; Bristol’s eclectic architectural styles and ever vibrant community. Annie uses a number of mediums including spray paint, acrylic and collage elements creating depth of field in her scenes and an intriguing texture to her pieces. We love: the juxtaposition of a soft pastel palette with industrial shapes and open ended horizonal lines. My paintings are figurative, created from spotting places whilst travelling on my bike or on the train. I live and work in Bristol, and over the three years I’ve been here it’s amazed me how rapidly it has changed and continues to do so. My journeys, like in many cities, take me through very different corners of urbanity, with drastically different micro economies; social structures and histories. This is reflected in its architecture – at present; buildings being demolished and those being constructed. Each day can look completely different. In this sense, I look to paint a scene from snapshots, anything that triggers a need for me to document shape, colour and feel on canvas. City life can be so layered and complex! I love to combine simple forms with small details. What led you to put another side to you out there alongside your design work? I hit a huge creative block just over a year ago, which enabled me to ask myself what was needed and how it needed to be expressed. I gave myself a lot of time and patience and started developing ideas that I really, truly believed in, and that I felt needed to come to life. I guess I came to a point where the design work by itself wasn’t enough, I needed to be much more expressive and listen to what wasn’t being said. With an already successful career as a pattern designer, what tips do you have for those out there thinking of taking the leap and starting a new venture? My first piece of advice would be to read The Artist’s Way by Julia Cameron – it will change your direction and challenge all the rubbish we tell ourselves to stop living our dream. My yoga teacher said to me ‘get out of the way of what you are really here to do’ – this still echoes in my mind as fear is a huge factor in blockages if not the ultimate one! Reframing our mental processes can be all that is needed over time. 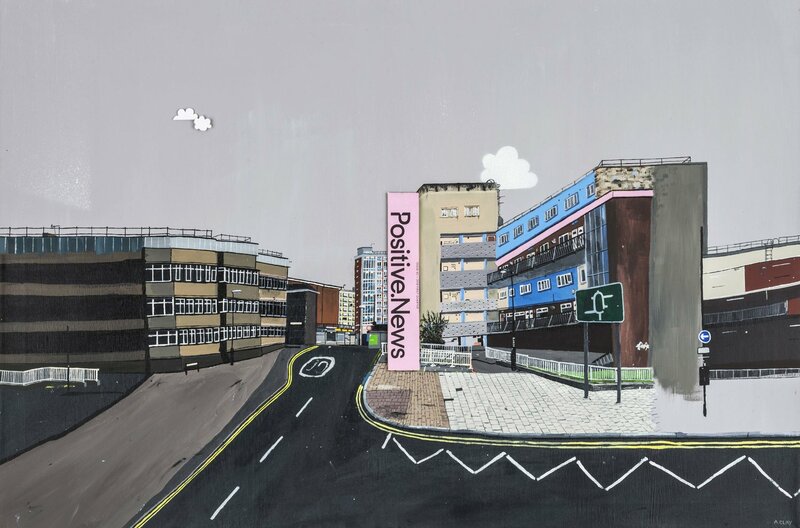 Positive News is based on an area of Bristol I travel through daily on my commute. Architecturally I loved the angle and interplay of the buildings, the colours used to ‘lift’ the buildings and the feel I got from exploring it many, many times. The collage came about as a way of challenging our perspective on circumstance, perhaps ungrounded judgements and class systems. To challenge the viewer to see beauty where perhaps we don’t usually and vice versa. Let’s fast forward a year or two, what is next for you on the art agenda? Ooh that’s a hard one! At the moment I’m focusing on a new body of work surrounding the role of female role models in industry and continuing to locate some inspiring city spots to paint from. I’d like to travel overseas to explore and paint and I do fancy a residency somewhere perhaps Scandinavia. I’d love to get into the RA summer show next year, that would be a dream. To keep growing and expanding my work and exhibitions would be great. An art fair in early 2019 will hopefully happen too. Oh and I’d love to have a coffee with Grayson Perry! Ha ha. Bristol is a dynamic, all singing all dancing kind of a place which embraces everyone and instantly makes you feel at home. It’s enriched by its inhabitants; grounded by its communities and it’s got a great food scene. Sorry…two sentences ha! 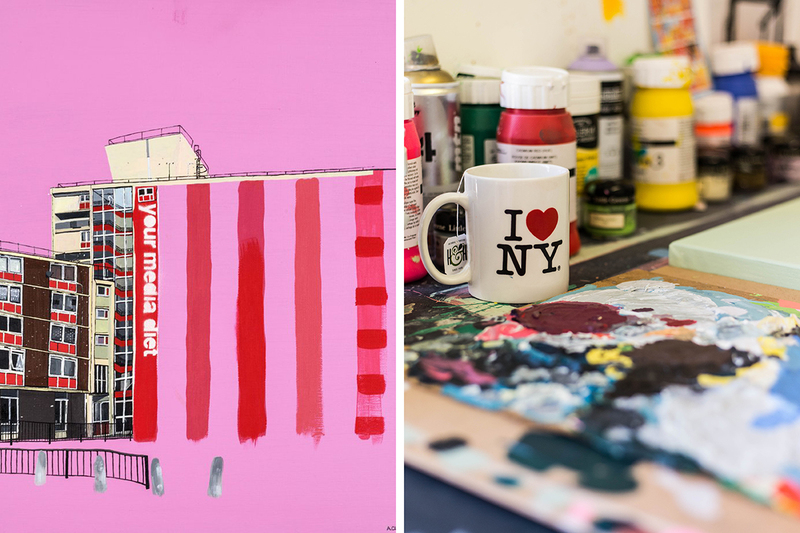 Bristol and Brighton are often closely compared in terms of being dubbed ‘creative hubs’, having lived in both cities (and London) how do you think the art scenes differ? I was at university in Brighton so at a really different time in my career and life. They do have a really similar feel, being a student there was really enriching because of the incredible local music scene and venues; and the arts campus was slap bang in the centre opposite the beautiful pavilion. Its close proximity to London I think makes the London/Brighton arts scene connect more easily. Bristol is a city that enables people to expand and explore their practices without the intense competition I felt in London. I can relax and find my feet much more here, which is so important! Where do you recommend for visitors to get a taste of Bristol art? My favourite art venues in Bristol are Spike Island which is in a renovated tea factory on the harbourside; the Arnolfini; the Watershed for indie and foreign films and a little further afield Messums in Wiltshire – worth the drive. It’s stunning there. When you are not busy with your head down in the studio, what is the best spot in town to wind down? There are so many and I’m always going for coffee’s! I love Poco which is conveniently next to my studio – really strong coffee and great brunches. Yogasara is my yoga home, its a 5 minute walk from where the new Artist Residence will be, and the teaching is incredible. I also love the Bristol Lido for a more luxurious escape, they’ve got an outdoor pool surrounded by a cafe/bar and a spa and feels like a mini break from the craziness of the city.